Sorry, we are currently sold out of 'Colombia Supremo La Palmera'. Please check back later. Arrived late first of January 2019, in protective Ecotact bags, a nice touch for Supremo grade. La Palmera is the result of La Meseta's national expertise to deliver a blend of Caturra and Castillo varietals that present balanced notes of citrus, stone fruit, and rich chocolate. Compania Cafetalera La Meseta is a family owned green coffee exporter. The five Munoz siblings operate the company's dry mill in the city of Chinchina, in the Department of Caldas, part of Colombia's coffee axis, a recognized UNESCO world heritage region. La Meseta purchases coffee from producers across Colombia's many growing areas, working closely with co-ops and individual land owners to find the best coffees, from the border with Ecuador through the highest volume producers in Antioquia. The Munoz family also operates several wet mills to process coffee cherries and still grows coffee on their original family property, Finca La Guamera. Caldas is one of Colombia's principal coffee growing Departments. 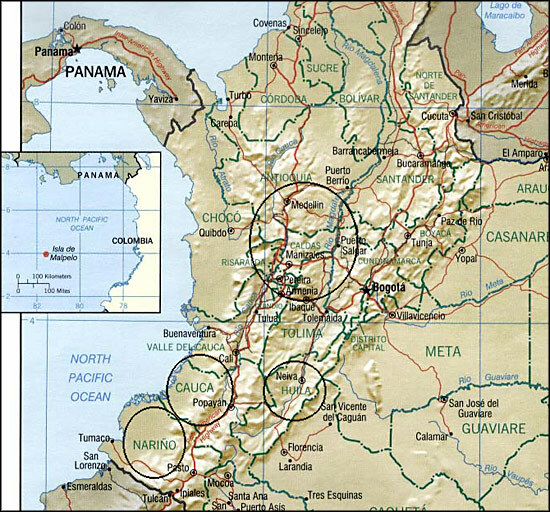 Along with neighboring Risaralda and Quindio, where we visited some years ago, it forms part of the coffee axis or coffee triangle, indicating the important coffee activities from research to social support programs to freeze drying to dry milling that take place in the area, which is in turn part of the Coffee Cultural Landscape, recognized by UNESCO as a World Coffee Cultural Heritage site. Some of the Colombia's most prized and award winning coffees come from this region. Caldas' rolling landscape is defined by slopes planted with coffee. High, chilly cities and towns sit along mountain ridges, where smallholder farms and mid-sized estates are planted with predominately monoculture coffee, protected from excess sun by the regions near constant misty cloud cover. Many programs of the Colombian Coffee Growers Federation have their official seats in Caldas, including the Cenicafe research facility. Many farms in Caldas are comparatively accessible by main road, facilitating speed of processing and export. The Department is home to many respected universities and coffee producers have access to many business and education resources. Cup Characteristics: A somwhat savory Supremo with more substantial body than typically seen; citrus, succulent stone fruit. Clean cupping with sweet tones and clear, smooth finish. Roasting Notes: Durable, high grown coffee capable of roasts between City Plus (C+) and dark roasts past second crack, and steps in between. Supremo beans are large and dense, having enough acidity to hold up to dark roasting while still being flavorful. If you roast on a Behmor we suggest profile P2 for this coffee. We felt this profile offered the best combination of body and acidity. P3 was also quite decent.